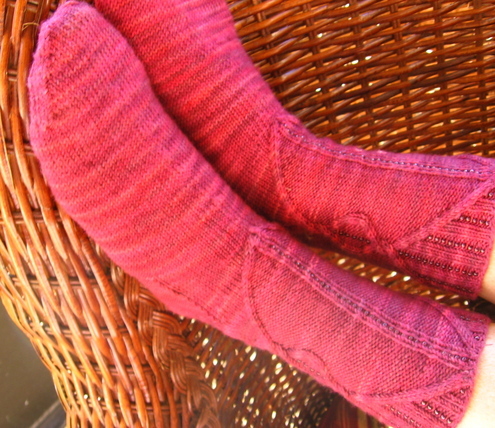 My last pair of socks sent courtesy of the Blue Moon Fiber Arts Rockin' Sock Club 2006 has finally been completed. Just in time to cast on the first pair of this year's club installment. I have loved every pair...so far. 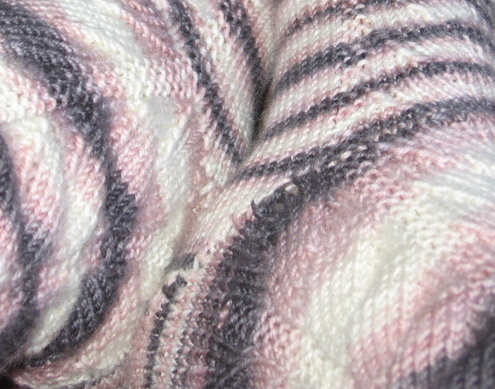 "Winters Eve" was cast on with one of the lightweight, semisolid colors called Mustang Sally. I purchases the intensely colored raspberry beads from an online source, Earthefaire. 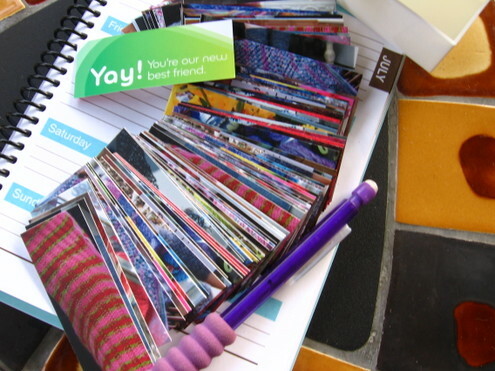 My guilt in not keeping up with the shipments was assuaged once I joined Revelry and a group called Socks The Rawk. 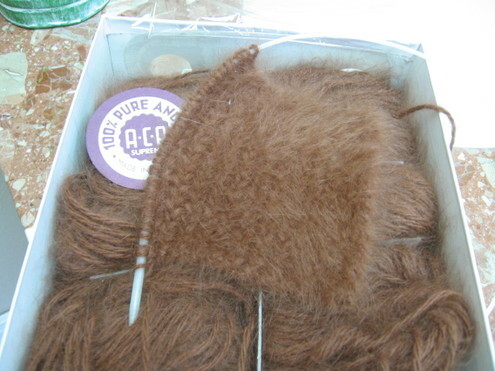 The amount of clubbers that hadn't knit from their STR stash was huge. An entire thread is devoted to those giving up their spot as a coveted STR club members. I am in great company. 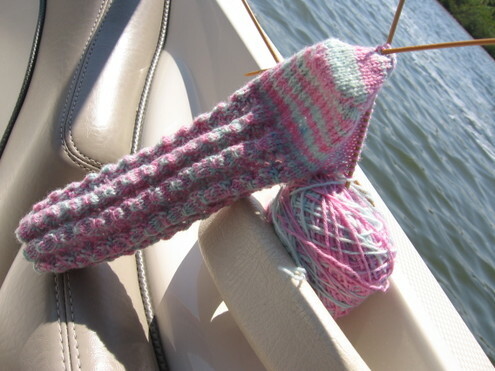 For the amount of money two years exclusivity cost, there was no way I wasn't knitting these. I regret that I rank among those not renewing. 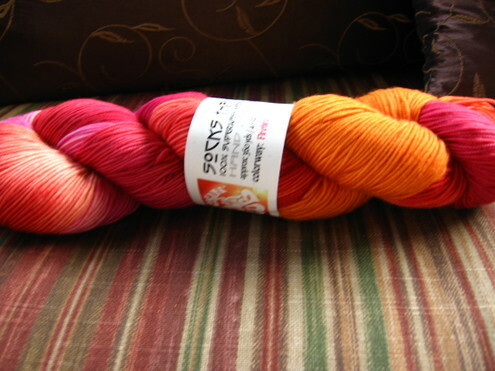 I can purchase more skeins of STR for the amount that it costs to be a third year member. 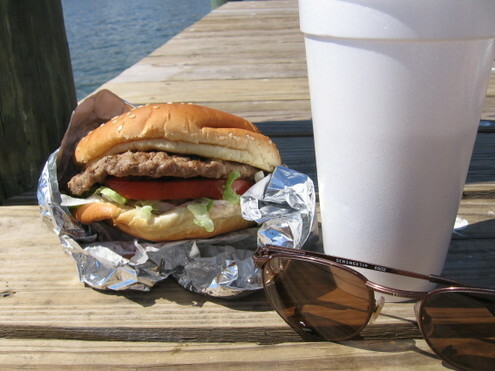 There are no regrets. 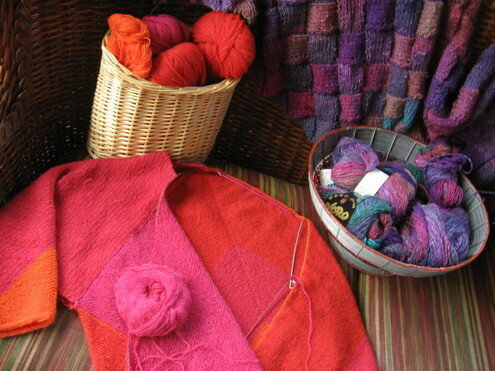 Every skein and pattern were a delightful surprise. 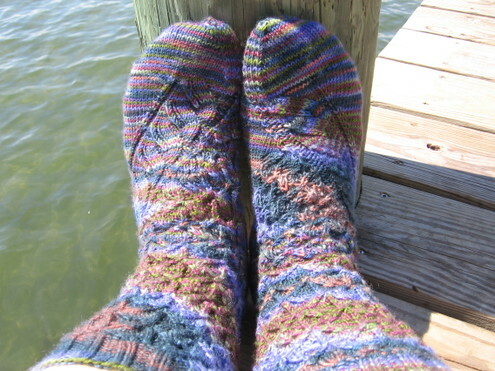 The pattens, all by talented designers, stretched my skills and had me knitting socks with stitches and styles that I may not have chosen otherwise. 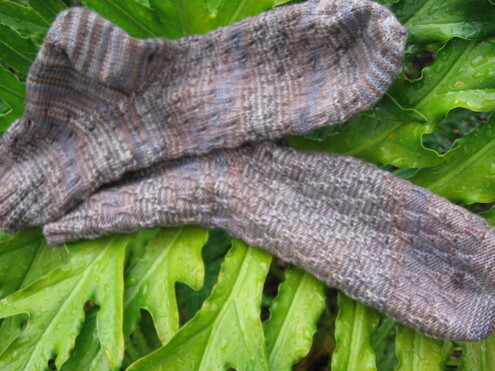 The latest installment is the lovely Lenore, a pattern written by the Yarn Harlot. 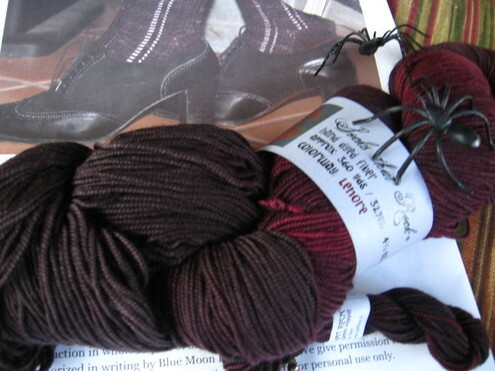 The yarn is a coveted skein from the Raven series that is making a November debut. I already anticipate several purchases based on this months color. Those black muted tones are just my style. Meanwhile I bid fond farewell to the club and make room for other rabid sock knitters who will be sure to enjoy a years worth of socks and surprises. 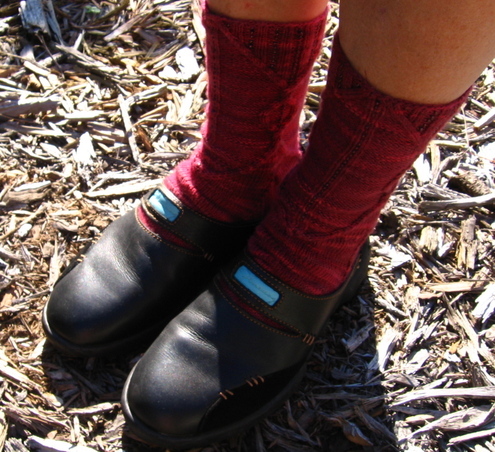 A quick "footnote", I found the perfect shoe to show off hand knit socks and worth every penny. 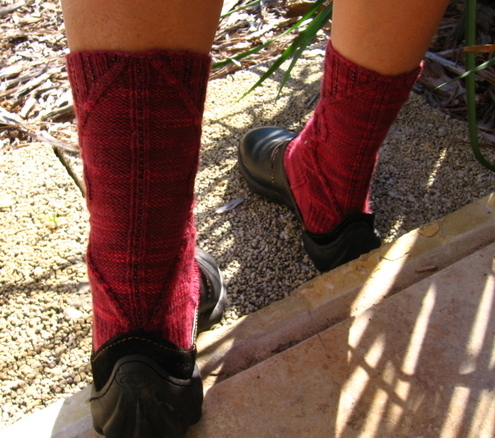 My new Fluevogs are comfortable and allow me to show off knitted heels as well. 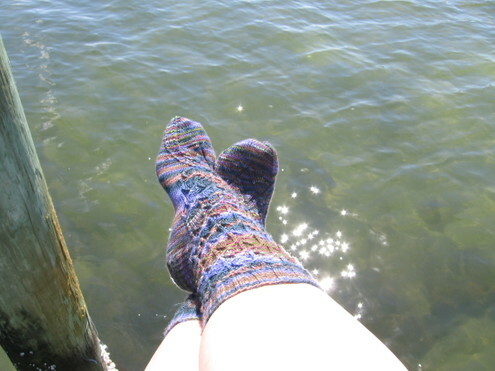 I took Marble Arches, a Rockin' Sock Club 2006 shipment, on our May trip to Hawaii. 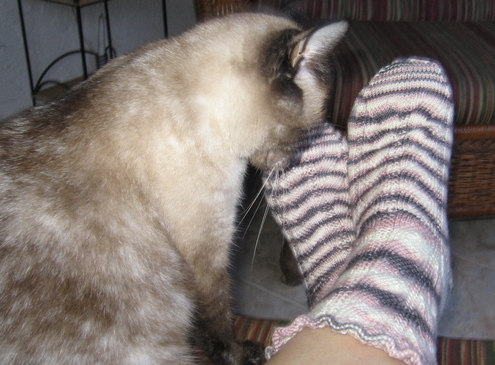 My hopes were to finish the socks and post my holiday knitting much sooner than this. Instead, I cast on new items and worked on other things that were of more immediate interest. 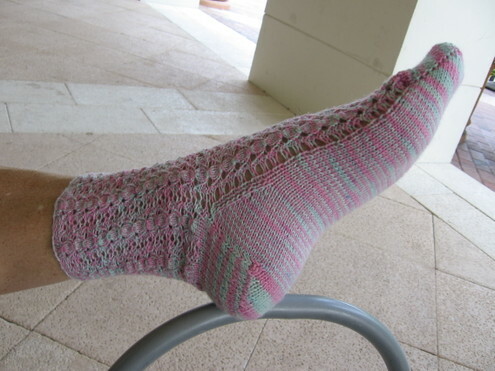 I am pleased to say that I finished sock two this evening. I rushed onto the porch out to photograph my small accomplishment while there was still some light left. 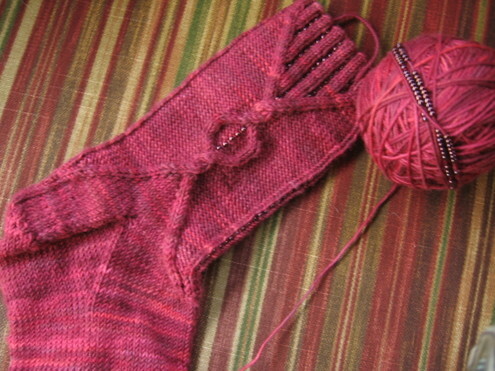 The socks are knit using Blue Moon Fiber Arts STR medium weight yarn in the Pink Granite colorway. I used the recommended 2.25 mm needles. 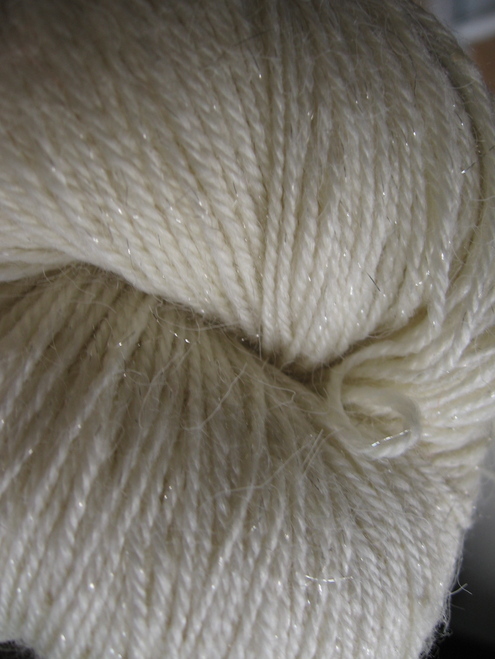 The resulting fabric is dense with little give. 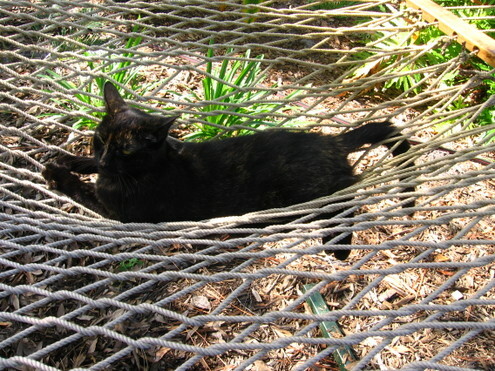 That's alright, the socks fit and are comfortable. 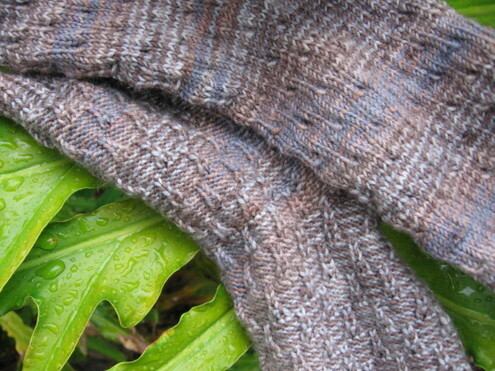 The pattern has you cast on 144 stitches and knit and purl them together to create the ruffled edge at the cuff. 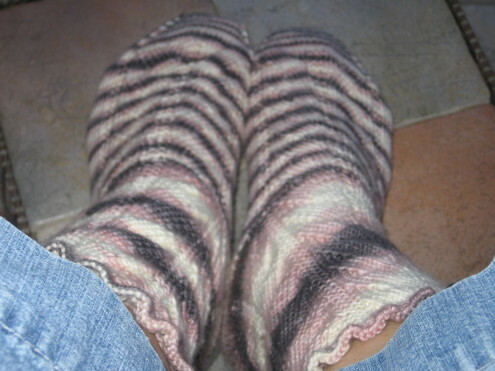 Three sets faux cables put me in mind of Cookie's Tatania sock that I finished earlier this year. My progress on keeping up with the bi-monthly shipments has been abysmal. 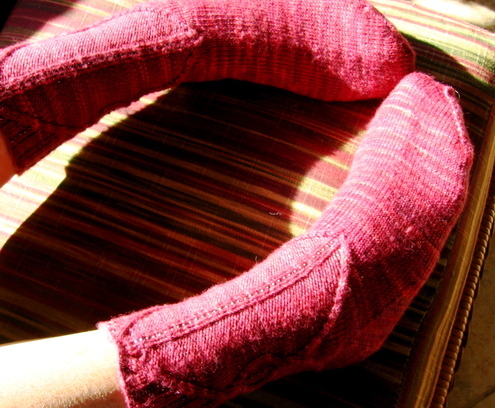 I have another pair socks, Winter's Eve, left to knit to finish out the year 2006. 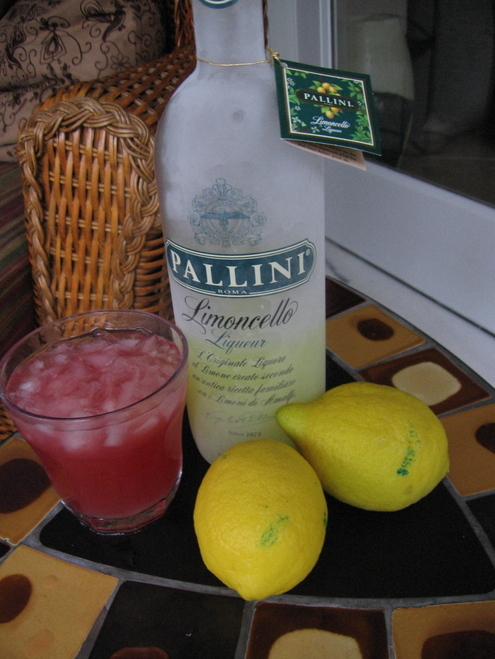 Then on to 2007. 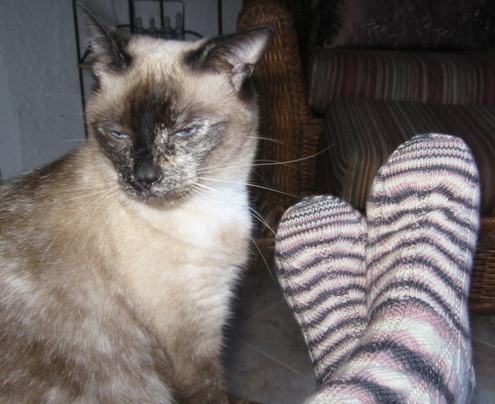 I'm not sure that my feet smell that badly, Koko!